Published: Oct. 15, 2017 at 06:11 p.m.
Chicago Bears running back Tarik Cohen takes the toss and passes to tight end Zach Miller for the score, giving Chicago a 10-0 lead. Published: Oct. 9, 2017 at 11:08 p.m.
Chicago Bears quarterback Mitchell Trubisky gets fortuitous bounce on first-career 20-yard touchdown. Published: Nov. 20, 2016 at 01:15 p.m.
Chicago Bears quarterback Jay Cutler finds tight end Zach Miller for 19-yard touchdown. 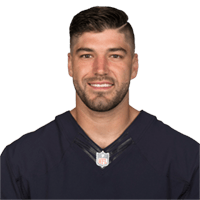 Published: Oct. 2, 2016 at 03:15 p.m.
Chicago Bears QB Brian Hoyer finds tight end Zach Miller for a 6-yard TD.